Egypt's House of Representatives (photo via Flickr user Hossam el-Hamalawy). Background: As early as January 2018, some Egyptian policymakers and media outlets began highlighting the importance of introducing constitutional amendments. While these calls initially centered on presidential terms limits, on February 3, 2019, the Coalition in Support of Egypt submitted a broader package of draft constitutional amendments to the Speaker of the House of Representatives. This proposal was then reviewed for compliance with the constitution and the House’s bylaws and voted on by the General Committee on February 5. It is currently still before the House of Representatives. The draft constitutional amendments extend presidential terms from four years to six, iterating a maximum of two consecutive terms. A separate provision allows the current president to pursue reelection under the new amendments once his current term comes to a close. Exercising presidential oversight over the judiciary, the amendments authorize the president to appoint the heads of various judicial bodies and the prosecutor-general, and to chair a Supreme Council for Judicial Bodies and Entities. Various other provisions in the amendment proposal package involve the creation of a second chamber of parliament, with one-third of its members appointed by the president; the establishment of a quota for women in the House of Representatives and greater representation for other minorities; the creation of at least one vice-president position; and the removal of the State Council’s authority to review contract proposals that involve state or public authorities. Significance: The current proposed amendments to the constitution raise severe concerns over the fundamental and lasting ways in which they will alter Egypt’s legal landscape, state-society relations, and power dynamics. By amending the constitution to allow President Abdel-Fattah El Sisi to pursue two consecutive six-year terms after his current term comes to a close in 2022, the amendments create a political reality in which the current president may serve for a total of 20 years. Additionally, by allowing the president to exercise control over the judiciary, and expanding the authority of the military to, for the first time, maintain some sort of constitutional and legislative oversight, separation of powers faces a severe blow. While the president’s exercise of control over the judicial and legislative branches of government, the expansion of military authority, and the extension of Sisi’s power are ongoing trends, enshrining them in the constitution threatens to thoroughly dismantle the rule of law and pave the way for enduring constriction of the public sphere. While some of the constitutional amendments proposed may afford greater representation for minority groups, this representation will occur amid a broader context of decreased influence and decision making ability for the individual policymaker. Next Steps: The House of Representatives will vote next whether to adopt fully, adopt partially, or reject the amendment proposal in principle. If a majority of representatives vote to adopt in principle, the proposal will subsequently be sent to the Constitutional and Legislative Affairs Committee for review. Other representatives may also submit changes to the proposal during this time period. If the Committee approves the amendments, the proposal will be returned to the full legislature for debate, discussion, and a final vote. If the amendments are approved by a two-thirds majority, a national referendum will be scheduled. Legal Context: The current Egyptian Constitution has been in force since January 2014; it came to replace the 2012 Egyptian Constitution which was suspended when former president Muhammad Morsi was ousted from power in June 2013. While amendments to address gaps in the constitution are a part of any country’s transitional history, Egypt’s inability to maintain a single constitution for more than five years calls into question its legal stability. The proposed constitutional amendments are the latest in a set of legislative proposals that have strengthened the power of the executive, military, and security apparatus at the expense of the independence and autonomy of other institutions, including the Judicial Authority Law, the Military Immunity Law, a new media regulation law, and continued renewals of the nationwide state of emergency since April 2017. Political Context: Under Sisi’s nearly five years in office, Egyptian authorities have cracked down on media institutions, political opposition groups, and civil society activists in an effort to eradicate all forms of dissent and exert control over the public sphere. The government has also taken steps to consolidate power over the various branches of government, marginalizing any opposing political forces and establishing a system of authoritarian rule. The House of Representatives, for example, has become a legislative rubber stamp for executive policies, and many representatives have been outspoken in their support for the constitutional amendments, claiming that the changes will guarantee continuity during a period of transition. The tightening control over political affairs has culminated in the proposal of these amendments that secure Sisi’s influence and the entrenching of the military in state affairs, as well as suggest that any real opposition to the amendments will be dealt with severely, particularly as all of this occurs amidst a nation-wide state of emergency. Adherence to Legal Norms: A number of the proposed constitutional amendments threaten to violate Egypt’s existing constitutional obligations. Despite the clarity of Article 226 of the constitution—which states that “texts pertaining to the reelection of the president of the republic…may not be amended, unless the amendment brings more guarantees” —the amendment proposal at hand has proceeded within the House without constitutional challenge. It is unclear how the presidential term limit amendments “bring more guarantees,” as required by the constitution, when the changes are likely to result in a single president serving for up to 20 years, while furthering many of the problematic trends described above. Additionally, Article 186 of the constitution establishes the independence of the judiciary. Constitutional amendments that allow the president to exercise control over judicial appointments significantly threatens this independence and the ability of the court systems to reach determinations that may not be in favor of the sitting president. By assigning the armed forces the authority to “protect the constitution,” the proposed amendments raise significant questions regarding how this role is meant to interact with the role of existing state institutions central to the country’s rule of law, including the House of Representatives as the legislative authority (per Article 101) and the Supreme Constitutional Court as the exclusively competent entity to determine the constitutionality of laws and interpret legislative text (per Article 192). 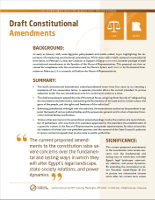 Because these proposed amendments risk extending the lifeline of a system of governance that has ushered in significant deteriorations in the rights and freedoms of Egyptians, Egypt’s constitutional and international legal commitments per treaties like the International Covenant on Civil and Political Rights and the International Covenant on Economic, Social, and Cultural Rights are called into question. Text of the Draft Law: A copy of the draft amendments as submitted to the Speaker of the House of Representatives on February 3, 2019, and as released by Representative Haitham al-Hariri, is available here. A copy of the General Committee’s official report on the amendment proposal is available here.